Venezuelans wait in La Candelaria to register with a government office. years, fleeing their own nation’s hyperinflation, sinking economy, soaring crime rates and empty stores and pharmacies. 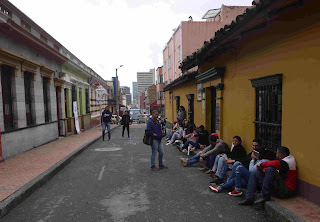 Colombia has been remarkably accepting, perhaps because in past decades Venezuela received innumerable fleeing Colombians, and because many of the Venezuelans crossing the border are children or grandchildren of Colombians who fled into Venezuela. Now, Colombia wants the Venezuelan immigrants to formulize their status here by registering. Waiting to transfer money to Venezuela. Remarkably, there’s been little public resentment against the Venezuelans, except by some concern about crime and grumbling by low-income workers and prostitutes that the Venezuelans are taking away jobs. But so far in the congressional and presidential campaigns, no populist candidate has seized on the Venezuelans to get votes.